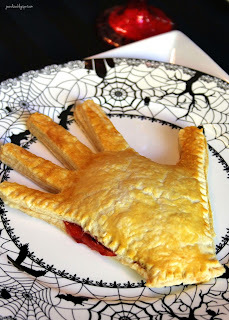 One of my favorite desserts from our Halloween dinner this year was our cherry hand pies. They're literally "hand pies". Get it? That joke alone was worth making them. Sue says it's not funny.... I disagree. 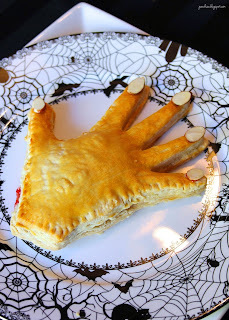 Anyway, this dessert is a great way to celebrate Halloween without a huge amount of effort. I used our Never Fail Pie Crust but any pie crust will do (even store bought). 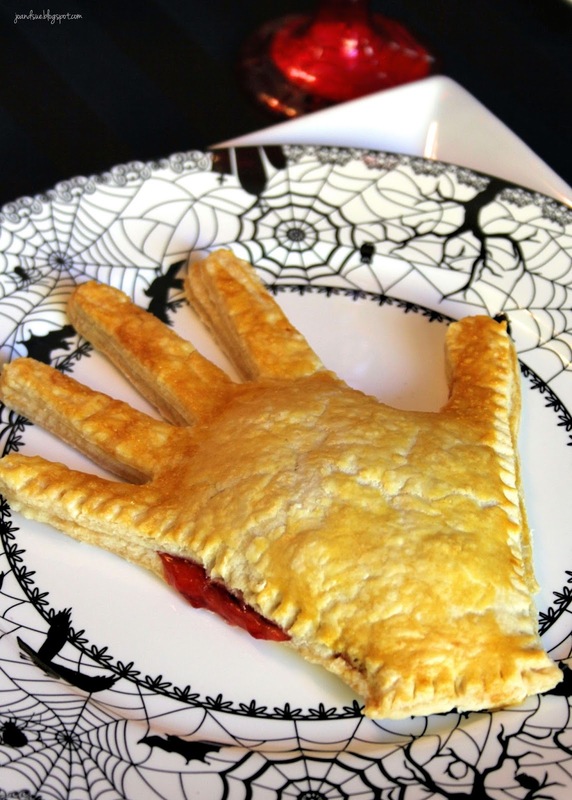 The crust and a can of pie filling and *voila* you are ready to make these spooktacular pies. Preheat oven to 375. Line a cookie sheet with parchment paper, set aside. Prepare pie crust as per instructions. 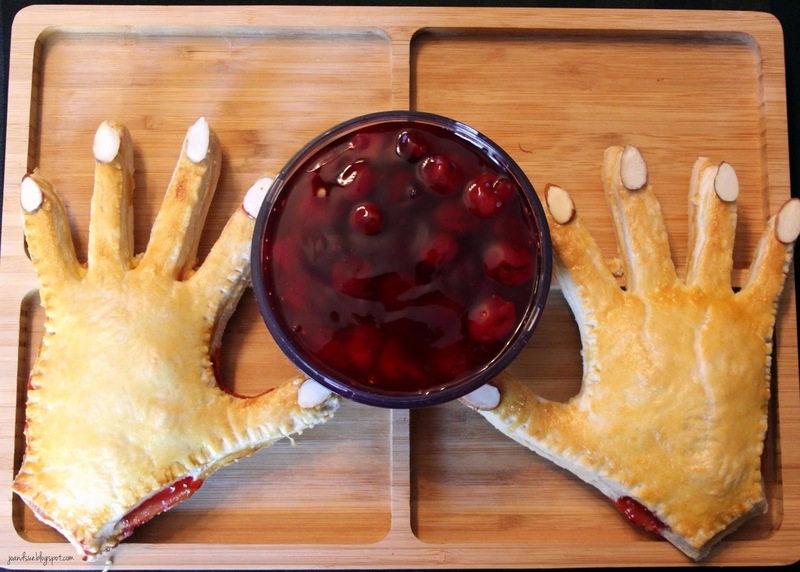 You will need half of our recipe to make 5 hands. 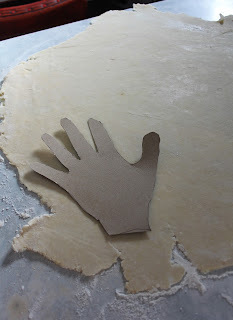 Trace your hand on a piece of cardboard (I used a cereal box), and then cut it out. 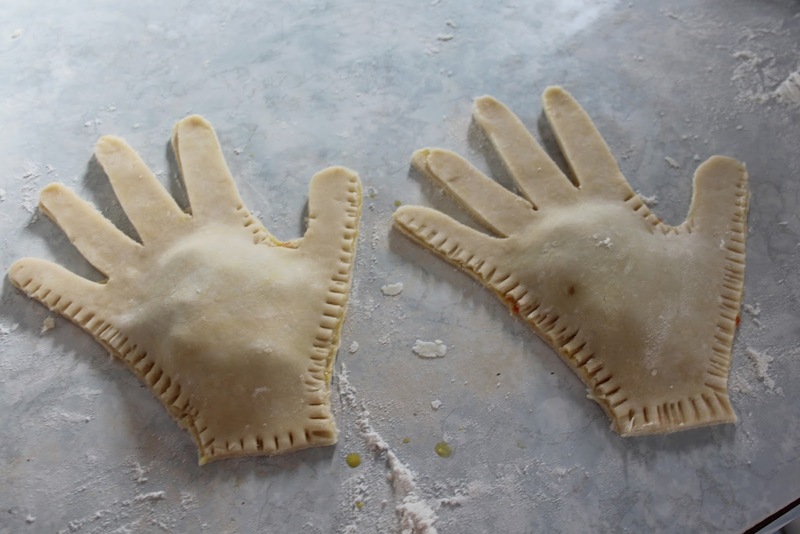 Roll out the dough to a little less than 1/4 inch thickness. 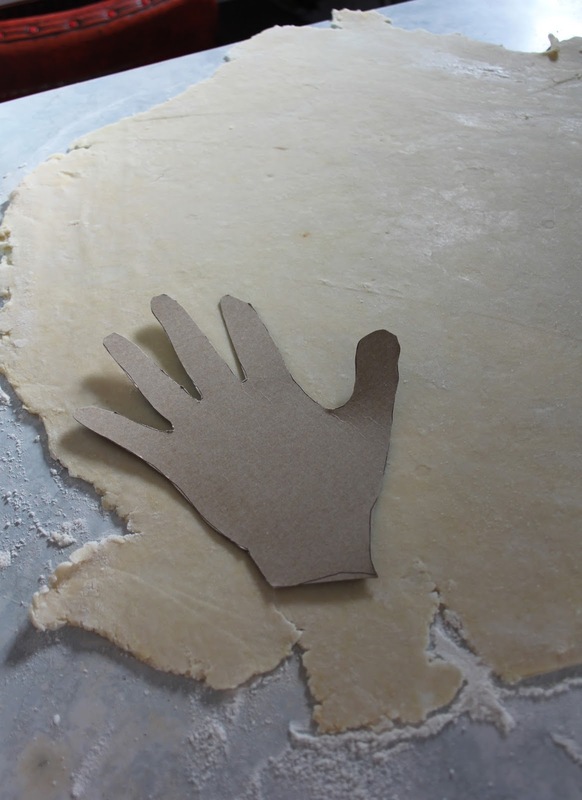 Place the cardboard cutout of your hand on the dough and cut out as many as you can. Reroll the scraps once or twice and cut out as many as you can again. I ended up getting 10 hands (to make 5 pies). 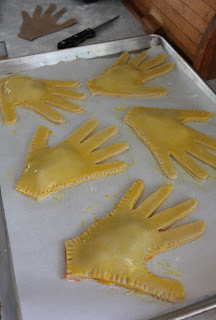 Place a hand on a flat work surface and, using a basting or pastry brush, brush the beaten egg over the surface of the hand. Place a generous scoop - about 1/4 to 1/3 of a cup - of the pie filling in the palm of the hand. Cover with another hand cut out. 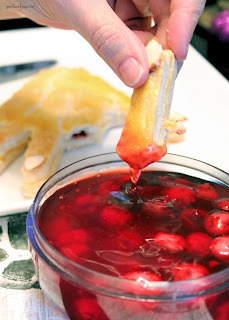 Using a fork, gently press around the edges to seal the pie. There is no need to seal the fingers, just around the palm of the hand, thumb, and baby finger. (See photo for details). 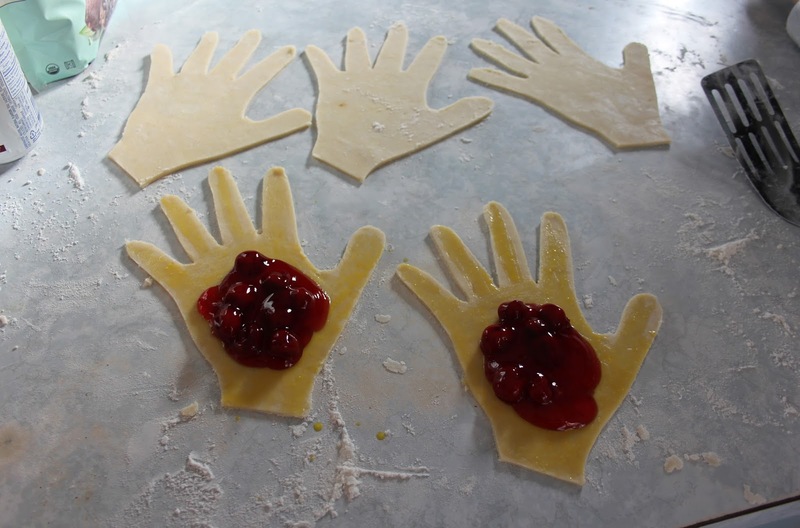 Place hands on prepared cookies sheets. Repeat until all your hands are used up. You will have some cherry pie filling leftover. Reserve this for serving. Brush the tops of the hands with the beaten egg. Bake at 375 for 10 minutes. Then turn down the heat to 350 and continue to bake until pastry is golden brown - about 20 - 30 minutes or so. Let cool on wire rack until room temp. Serve warm or room temp. 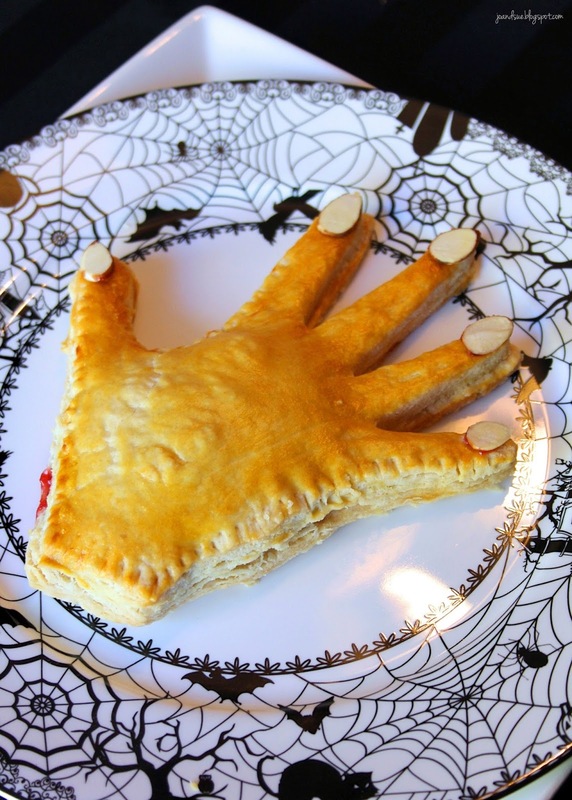 You can decorate the pies with sliced almonds for nails, if desired. Simply use a little of the cherry pie filling as glue. 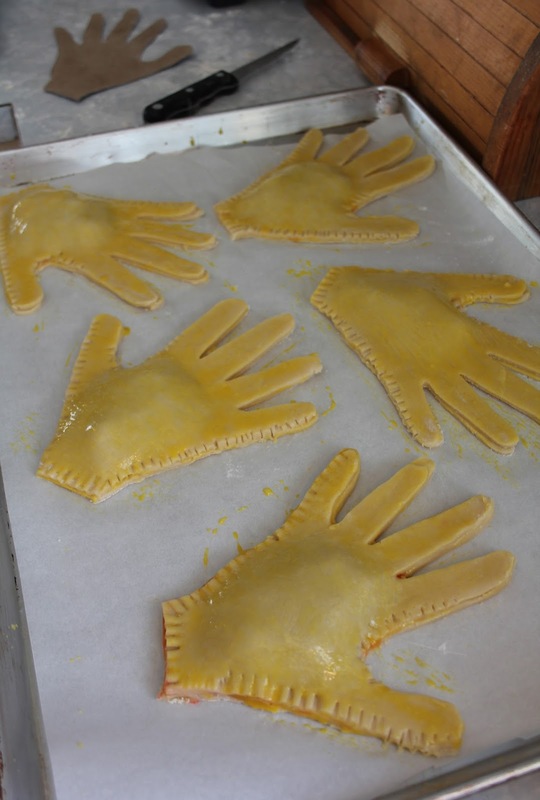 Serve the pies with the extra pie filling for dipping the finger in! The fingers don't have any filling so serving with dip is a great way to eat them. 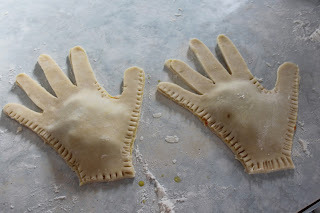 I believe if you were to use a store bought crust - like one for one double pie crust - then you would probably only get 2 complete hands out of it. 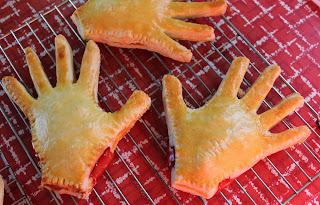 Using half of our recipe you get 5 complete hands - maybe more, depending on the size of your hands. 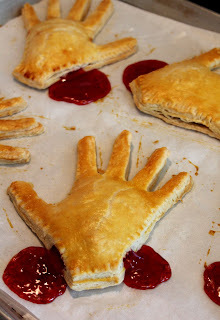 I served Hand-Burgers at our party this year and these would have been a perfect addition to the menu.